With advances in cloud computing and the emergence of service marketplaces, the popularity of composite services marks a paradigm shift from single-domain monolithic systems to cross-domain distributed services, which raises important privacy and security concerns. Access control becomes a challenge in such systems because authentication, authorization and data disclosure may take place across endpoints that are not known to clients. The clients lack options for specifying policies to control the sharing of their data and have to rely on service providers which provide limited selection of security and privacy preferences. This lack of awareness and loss of control over data sharing increases threats to a client's data and diminishes trust in these systems. This is a manuscript of an article published as Ranchal, Rohit, Bharat Bhargava, Pelin Angin, and Lotfi ben Othmane. 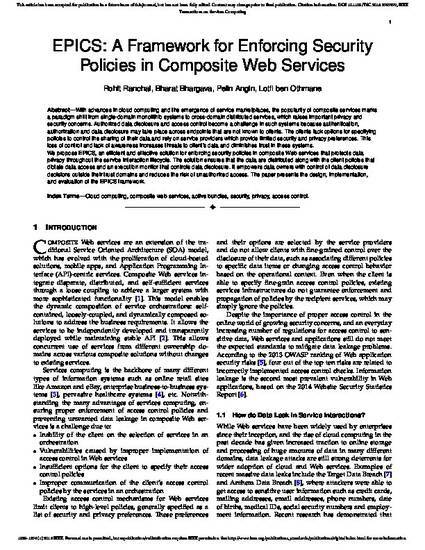 "Epics: A framework for enforcing security policies in composite web services." IEEE Transactions on Services Computing (2018). DOI: 10.1109/TSC.2018.2797277. Posted with permission.